Admire the Golden Gate Bridge and Pacific Ocean on this relaxing, family-friendly bike tour in the evening hours. 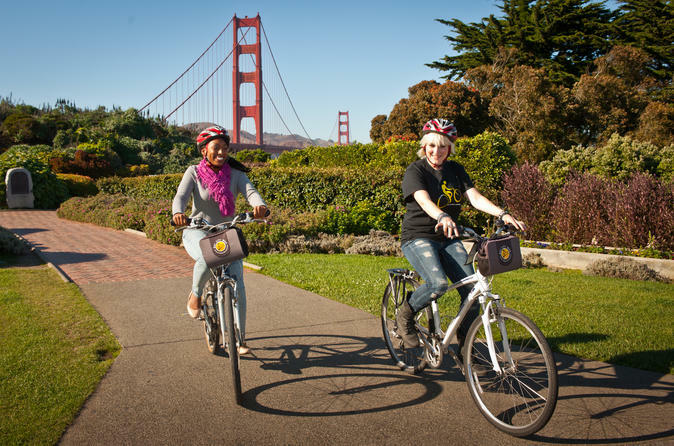 See top San Francisco attractions including Fisherman's Wharf, Crissy Field and Fort Mason as you follow the coastline on a regular or electric bike. Then ride across the Golden Gate Bridge, pausing for spectacular photos of the shimmering (or fog-wrapped) San Francisco skyline before sunset. Head back into the city to see the Palace of Fine Arts, San Francisco National Cemetery and other Presidio sights, and to listen to your guide share stories about San Francisco's colorful history. Begin your tour at bustling Fisherman's Wharf in San Francisco, where you'll hop aboard either a regular or electric bike, depending on the option you selected. Safety equipment is included and this easy ride is appropriate for all ages and skill levels, so the whole family can join in the fun! Ride alongside some of San Francisco's many piers and Crissy Field, with its stunning vistas of the Golden Gate Bridge. See major sights including Aquatic Park, Fort Mason and the Marina District as you pass joggers, kite flyers and beachgoers enjoying the sea breezes and gorgeous views. Admire the grand Palace of Fine Arts, which was built in 1915 for the Panama-Pacific International Exposition and today hosts concerts and events. Pass Fort Point, right under the Golden Gate Bridge, and then ride your bike across the west side of the bridge itself for amazing photo ops of the cliff-edged coastline. At the north end of the bridge, take in panoramic views of the San Francisco skyline and Alcatraz from Vista Point before the crimson light of sunset descends on San Francisco Bay. Make your way back into the city to the Presidio for more sightseeing. Pass by two entertainment institutions, the Walt Disney Family Museum and the headquarters of Lucasfilm. See the San Francisco National Cemetery, where thousands who served in the military are buried, and Presidio Pet Cemetery, where animals owned by families stationed at the Presidio were laid to rest. Ideal for both scenery and history lovers, this bike tour shows you plenty of city highlights in a short span of time. Your 3-hour sunset bike ride ends back at Fisherman's Wharf, but you can continue to use your bike to explore for a few hours before closing time. If you still have the energy, ride along the Embarcadero and Pier 39 or continue to AT&T park and see where the SF Giants play baseball!